Aphasia-from the Greek aphatos (`speechless')-describes impairments and disabilities in the use of language arising from, for example, strokes, trauma, tumours, surgery, or progressive brain deterioration. It includes problems with the expression and comprehension of language in speech, reading, writing, and signing. Research in and around aphasia continues to flourish such that, even for specialist aphasiologists, it is extremely hard to keep up to date with developments. There is a real threat of laboratory-based human research, neuropsychology, computational-modelling research, and brain-imaging studies proceeding in ignorance of each other. Indeed, the sheer scale of the growth in cognitive neuroscience makes this collection especially timely and welcome; it permits ready access to the most influential and important works across the full breadth of the discipline. The materials gathered in Volume I include explorations of the foundations of aphasiology. The major works collected in the second volume examine theoretical developments, while Volume III is organized around contemporary issues in aphasiology. The final volume makes sense of clinical issues, such as recovery, assessment, and rehabilitation. 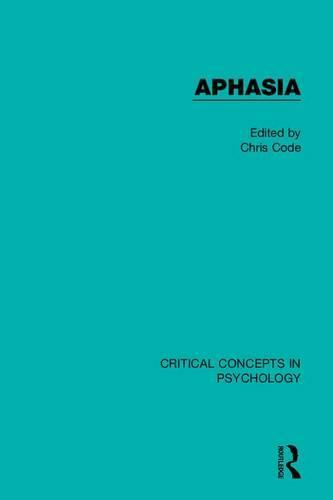 With a full index, together with a comprehensive introduction, newly written by the editor, which places the collected material in its historical and intellectual context, Aphasia is an essential work of reference. For researchers and advanced students, it is a vital one-stop research and instructional resource.